With no signs of Ecommerce growth slowing down, the need for businesses to be online trading securely has never been greater. SSL (Secure Sockets Layer) is the globally recognised standard for securely encrypting information being passed between a server and web browser. The SSL Security Certificates we offer are exactly the same as those being used by the leading online businesses and banks. Providing your users with essential peace of mind, SSL certificates signify you offer world-class data protection, increasing both trust and revenue. Websites with SSL certificates guarantee stringent security checks are in place to protect user’s private information, such as their bank details. As a website owner, you can trade online safely in the knowledge that the SSL secure connection will make sure all important information is kept out of reach from prying eyes. 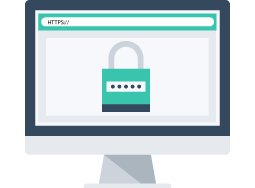 Having an SSL certificate will keep your visitors coming back time and time again, safe in the knowledge you provide a secure service. SSL certificates are not exclusive to websites trading online. If your site requires a log in for protected information, make it secure with SSL technology. An SSL certificate prevents data being intercepted when it is being accessed by authorised users. Having an SSL certificate verifies you are who you claim to be and that customers can complete a transaction with confidence. Building confidence with your visitors will make them more likely to come back again and again. Research has shown that up to 75% of potential customers abandon a retail website due to security concerns, so a recognised, industry-standard SSL certificate will help increase your conversion rates and build up your reputation with customers. A visibly secured website helps you enhance your reputation and guard against possible attacks and fraud. An SSL Certificate will Provide your users with essential peace of mind and will increase both trust from your customers and revenue for your business. Contact our friendly sales team today! © 2005-2018 Hurley Internet. All rights reserved.